The Plymouth congregation of Unitarians founded a chapel in what was then known as Plymouth-Dock in 1790. Their Chapel in George Street, on the corner with Ker Street and Duke Street, was opened in 1791. The Unitarian Chapel when used as a Wine Store. 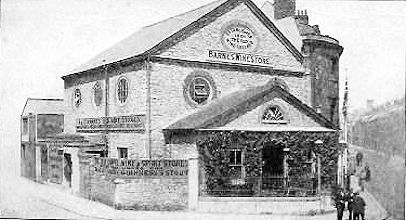 It became the Wine and Spirit Stores of Messrs A & C Barnes. It is thought that secret meetings continued to be held in Dock until the congregation re-established itself in 1820. No doubt spurred by the new name of Devonport, the construction of a new Town Hall, and the erection of the Column, the Unitarians opened the Granby Street Unitarian Chapel on Sunday June 21st 1829. The Old Chapel is currently being used as a Co-operative Store.